In a large bowl, whisk the warm water with the honey, 1/3 cup of salt, the peppercorns and mustard seeds until the honey and salt are dissolved; let cool completely. Add the pork chops to the brine, cover and refrigerate overnight. Bring to room temperature in the brine 30 minutes before cooking. Preheat the oven to 400°. On a large rimmed baking sheet, toss the tomatoes with the shallots and 1 tablespoon of the olive oil and season with salt and pepper. Roast for about 15 minutes, until the tomatoes start to wrinkle and the shallots are tender and lightly browned. Let cool completely. Increase the oven temperature to 425°. In a large bowl, whisk the vinegar with 2 tablespoons of the canola oil and the remaining 2 tablespoons of olive oil. Season the vinaigrette with salt and pepper. Prepare an ice bath. In a medium saucepan of salted boiling water, cook the snap peas until crisp-tender, about 1 minute. Drain and transfer to the ice bath. Once the snap peas are cool, drain well, pat dry and transfer to the bowl with the vinaigrette. Gently fold in the tomatoes, shallots, onion, parsley and chives and season with salt. Remove the pork chops from the brine and thoroughly pat dry with paper towels; discard the brine. Heat a large cast-iron skillet, then add the remaining ½ tablespoon of canola oil. Cook 2 pork chops over moderate heat, turning once, until browned, about 6 minutes. Transfer to a plate and repeat with the remaining 2 pork chops. Drain off any excess fat from the skillet. Return the pork chops to the skillet and roast in the oven for 8 to 10 minutes, until an instant-read thermometer inserted in the thickest part registers 135°. Transfer the pork chops to a work surface and let rest for 5 minutes. 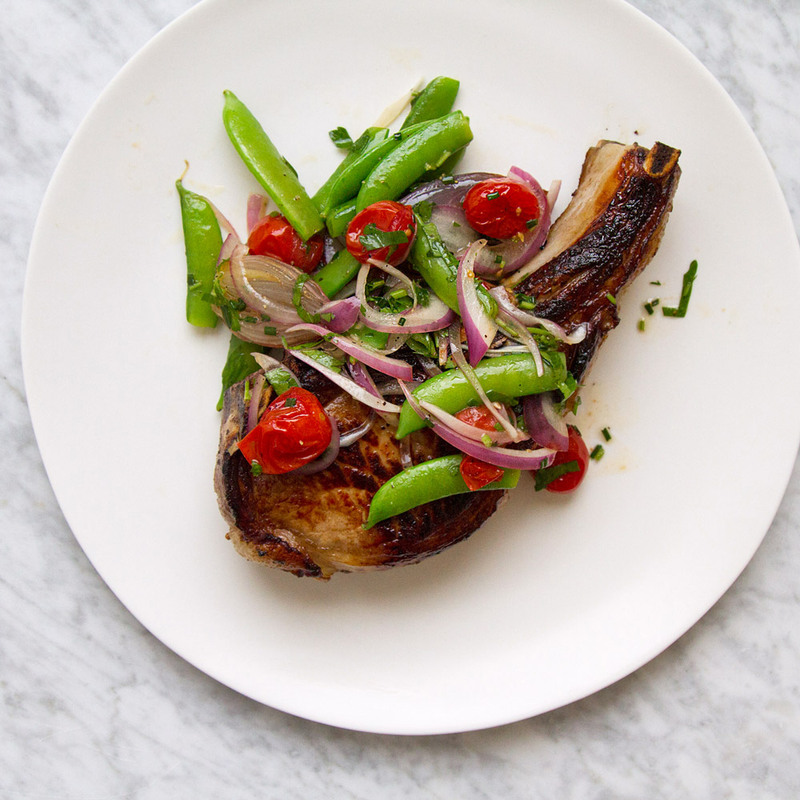 Serve with the snap pea salad. The peppercorn sauce can be refrigerated overnight and reheated gently before serving. Review Body: The pork chops side look really good however, I'm not a fan of all those greens on top! Review Body: Best pork chops I have eaten in a very long time. Do yourself a favor and make these. The salad to go along with this should be doubled, so good!